MANILA, Philippines – The 'April 2017 Electronics Engineer (ECE) and Electronics Technician (ECT) board exam results' together with the list of passers, top 10 examinees, top performing schools and related announcements are available at this website as PRC officially released the results online three (3) working days after the last day of board examination. As announced 1,033 out of 2,503 passed the Electronics Engineer Licensure Examination and 1,020 out of 1,273 passed the Electronics Technician Licensure Examination. 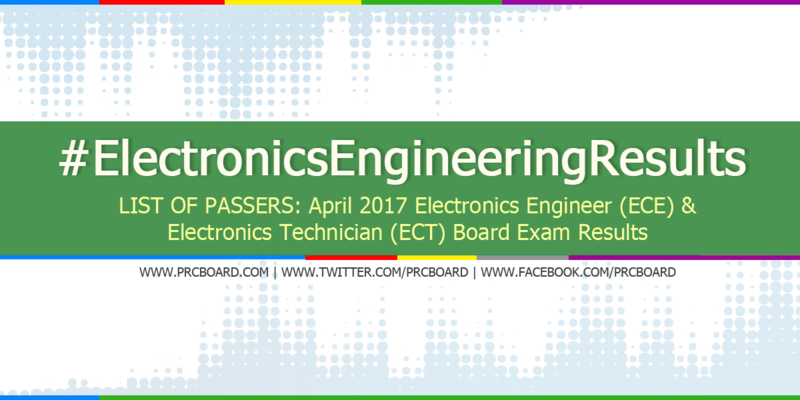 The April 2017 ECE & ECT licensure exams are administered by PRC Board of Electronics Engineering headed by its Chairman, Engr. Alnar L. Detalla and its members, Engr. Enrico Claro R. Delmoro and Engr. Herminio J. Orbe on April 2-4, 2017 at PRC testing centers in Manila, Baguio, Cebu and Davao. The schedule of online appointment for issuance of Professional ID and Certificate of Registration will be from April 17-20, 2017. According to the Commission’s Resolution No. 2016-1019 series of 2016 entitled “Schedule of Licensure Examination for Year 2017”, the target release date for the results of April 2017 Electronics Engineer ECE and ECT board exams will be on April 7, 2017 (Friday) or three (3) working days after the last day of board examinations. However, results may be released earlier or later without prior notice. On the same exams conducted by PRC on April 2016 and October 2016, results were out after three (3) working days. During October 2016 of the same exams, 1,914 out of 4,742 passed the Electronics Engineer Licensure Examination and 2,722 out of 3,642 passed the Electronics Technician Licensure Examination. UP Diliman was the top performing school in ECE having all of its 53 examinees passed while University of Santo Tomas topped the Electronics Technician having 86 out of 87 examinees hurdled the tests or 98.85% overall passing rate. Masaru Quemquem Nakaegawa from UST ranked first in ECE exams garnering 92.30% rating while Ronnel Padiernos Dayawon from UE Caloocan, Hexina Espiritu Madolid from DLSU Dasmariñas and VonCarlo Giovanni Dideles Pasco from TUP Visayas topped the ECT having 93.00% rating. On April 2016 board exams, 917 out of 2,482 passed the ECE and 985 out of 1,196 passed the ECT. UP Diliman was the only school in the top performing school list for ECE board exam having 19 out of 21 examinees passed or an equivalent 90.48% overall passing rate. Mapua Institute of Technology Manila ranked first in the ECT board exam having all of its 98 examinees passed, followed by Adamson University having 49 out of 53 examinees passed or 92.45% and Technological Institute of the Philippines (TIP) Manila having 47 out of 52 examinees passed or 90.38% overall rating. Paul Esteban Quibuyen from University of the East Manila topped the ECE board exams garnering 89.30% rating, followed by Charleston Dale Macutay Ambatali from University of the Philippines Diliman and Arvie Mae Trinidad Calimlim from Saint Louis University garnering 87.80%. Meanwhile, Robin Mon Rivas Miranda from Polytechnic University of the Philippines Sta. Mesa ranked first in Electronic Technician board exams garnering 94.00% rating. He was followed by Niel Mikhel Camposano Jamilano from Mapua Institute of Technology Manila having 93.00%. Meanwhile, below is the summary of board exam results for Electronics Engineering and Electronic Technician in the last three (3) years. To receive up-to-date news about April 2017 Electronics Engineering and Electronics Technician board exam results, we advise our visitors to bookmark this page, visit PRC official website or follow us at our social media pages via Facebook and Twitter.